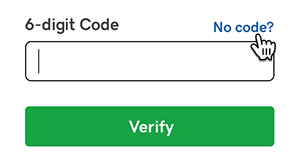 If you're using two-step verification (2SV) and aren't receiving the codes, or you're getting an error message, look in this list for solutions. I'm just not receiving the codes on my smartphone Make sure your carrier isn't blocking +1 (480) 360-5516. I got an error message that says, "To protect your account, we locked this verification method for 24 hours due to too many code requests." We lock a 2SV method when someone asks us to "resend code" too many times. Wait 24 hours and try again, or see Cancel two-step verification and follow the steps under I don't have access to that device. I'm using a phone number based in India and I'm not getting the codes Our text message provider Twilio might have problems reaching you. I don't have the device I set up for 2SV (lost phone, changed my number, etc.) See Cancel two-step verification and follow the steps under I don't have access to that device. My 2SV doesn't work and I want to cancel 2SV, but I can't cancel it without using 2SV to log in! See Cancel two-step verification and follow the steps under I don't have access to that device. If you set up a backup 2SV method, select No code? to choose your backup method from the list.